Need fantasy advice? You've come to the right place. Here's what you need to know heading into Week 10. 1. 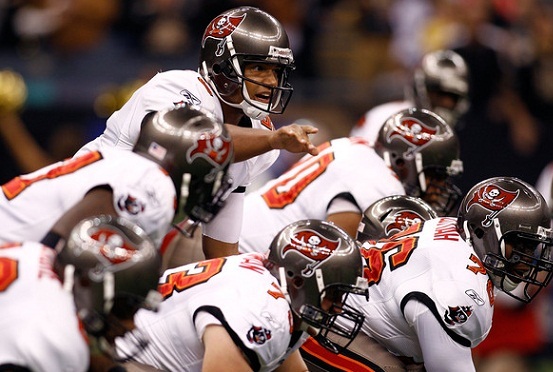 I see you, Josh Freeman. In the fantasy preview back in August, I said that I thought Josh Freeman would have a bounce back year due to all the new weapons on offense, but I definitely didn't expect what has happened over the last 5 weeks. Freeman is averaging 311 yards passing per game during that stretch, and has 12 TDs to just 2 interceptions. The additions of Doug Martin and Vincent Jackson have obviously helped the offense, but the key has been Freeman. Right now, he is on pace for over 4,000 yards and 32 scores. Not bad for a guy who was pretty much an afterthought for your team on draft day. 2. It's Thursday, and I think Doug Martin just scored again. Doug Martin put on a show in Oakland on Sunday, with an absurd 251 yard/4 touchdown performance. Martin left fantasy owners disappointed through the first 4 weeks, averaging just 62 yards rushing. But since Tampa's bye week, he has turned it on -- averaging 137 yards per game. Another positive for Martin is that he is getting the majority of the work in the backfield now. Over the last 4 games, he has 84 carries, while LeGarrette Blount only has 22. Expect more of the same the remainder of the season. 3. It's still "Beast Mode" time in Seattle. Marshawn Lynch has been the steady force for the Seattle offense this year, currently ranking 2nd in the league in rushing with 881 yards. Lynch is one of the rare matchup proof running backs. Outside of a Week 6 dud against the Patriots, he has not dipped below the 85 yard mark this season. 5 times Lynch has gone over 100 yards this year, and he faces several suspect defenses later in the season. You won't get a lot out of Lynch in the passing game, but 20+ carries and close to 100 yards rushing are the norm for Seattle's workhorse. 4. Andre Johnson is trending upwards. Over the last year and half, Johnson has struggled with uneven performances and injuries. But the veteran receiver from Miami has turned it on over the last 3 weeks. Johnson has 25 catches for 286 yards, and has been targeted 32 times during that stretch. The big problem with Johnson is not finding the end zone. He only has 2 touchdowns on the year, and has not reached paydirt since Week 3. When healthy, he is still a matchup problem for plenty of defenses around the league, and with the emergence of Owen Daniels at tight end, this could create more targets for Johnson during the second half of the season. 5. More credit to the Bears defense and special teams. I've wrote about Chicago's defense in the past, but after seeing them completely dismantle Tennessee on Sunday, they deserve to be talked about more. Led by Charles Tillman, Brian Urlacher and Lance Briggs, this unit has been a turnover forcing, touchdown scoring machine. To put it in a fantasy perspective -- only 5 wide receivers and 3 running backs have scored more points than Chicago's D, and they have outscored every tight end in the league in most ESPN formats. 8 touchdowns and a +16 turnover ratio should guarantee that the Bears will be in double-digit points every single week. *Catch me on Fantasy Football Live every Sunday morning from 8:00-9:00, and on the Thom Abraham Show every Wednesday afternoon starting at 3:40 for even more Fantasy Football talk on Sports Radio 560 WNSR Nashville.